What are Jet2's Baggage Costs? What is Jet2's Baggage Allowance? Find out Here! Don't let Jet2's baggage allowance restrict the amount of luggage you bring to your destination. If you send your luggage with Send My Bag you can have as much luggage with you as you like. Discover how cost effective it is to send your luggage and in turn treat yourself to a luggage-free journey. One item of hand luggage weighing up to 10 kg with dimensions that do not exceed 56 x 45 x 25 cm, plus one small additional personal item, such as a handbag, allowed at the airline's discretion. If your hand luggage is oversized or overweight, it must be checked into the hold, and fees will be charged. What If My Hand Luggage Exceeds Jet2's Baggage Allowance? If your cabin baggage exceeds 56 x 45 x 25 cm and/or 10 kg, your item must be placed in the hold and a fee will need to be paid. Jet2 permits passengers to pack liquids into their hand luggage as long as these liquids are in containers with a volume of no more than 100 ml. In addition, all liquids must be within one transparent, resealable plastic bag with dimensions no greater than 20 x 20 cm. Infants under the age of two do not receive a hand luggage allowance. Any food or supplies for the baby must be included within the accompanying adult's hand luggage. A collapsible buggy can be brought as far as the aircraft steps or air bridge, at which point it will be checked, free of charge. Musical instruments within the dimensions of 56 x 45 x 25 cm and weighing 10 kg or under may be brought on board as standard hand luggage. A slightly larger musical instrument may be permitted on board at the airline's discretion, provided it fits within the overhead lockers and a charge for the carriage of the item is paid. The Jet2 checked baggage allowance is up to three items of hold luggage, each weighing 22 kg or less. Bags weighing more will incur excess baggage fees. The cost of checking baggage with Jet2 depends on the route travelled and time of travel. For example, you can expect to pay £48/ £50 per 22 kg bag for a return trip between Edinburgh and Alicante. Young infants under the age of two do not have a full baggage allowance, but pushchairs and car seats (up to a combined weight of 10 kg) can be checked for free. Hold luggage that has not been prebooked before arrival at the airport will be charged at £45 per item. what are jet2's excess baggage fees? Jet2's excess baggage fees are £12 per kilo. 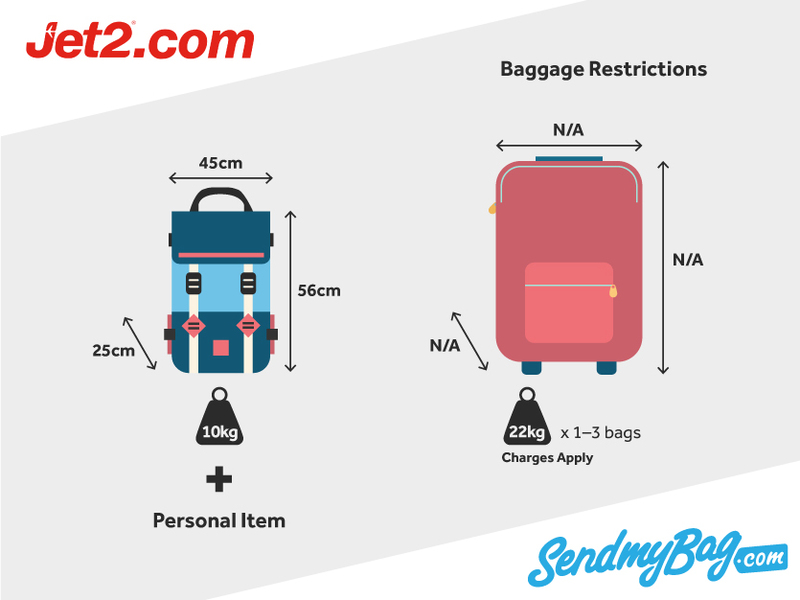 If a bag weighs more than 22 kg, an excess baggage charge will be levied. No bag over 32 kg will be accepted. Exceptional baggage may be checked into the hold. How much you pay for such luggage depends on the item. For example, golf clubs and bicycles cost £30, one way (if pre-booked online). Note that certain items, such as windsurfing boards, must be pre-booked by telephone. Bicycle: 182 x 91 cm; 32 kg per item. Looking for Jet2 sized hand luggage?